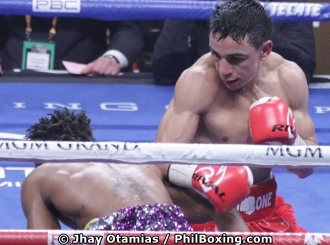 LAS VEGAS – In a high-profile fight on the undercard of the Manny Paquiao vs Adrien Broner welterweight championship at the MGM Grand Garden Arena Saturday night, Moroccan born Frenchman Nordine Oubaali repeated against Rau'shee Warren to win his first world title capturing the WBC world bantamweight title. Oubaali (15-0-0, 11KOs) defeated Warren (16-3,-0, 4KOs) in the 2012 London Olympics and dominated his American foe in the second half of the fight putting pressure on Warren with his strong rights and combinations to the body. Judges scores: Ricardo Ocasio – 115-113, Julie Lederman – 116-112 and Steven Weisfeld – 117-111 all in favor to the Frenchman. Coming up next: Badou Jack vs Marcus Browne for the WBA Interim / WBC Silver Light Heavyweight Championship.